Caltrain’s 150th Anniversary Will Combine Glimpse Back With Look Forward – Peninsula Moves! 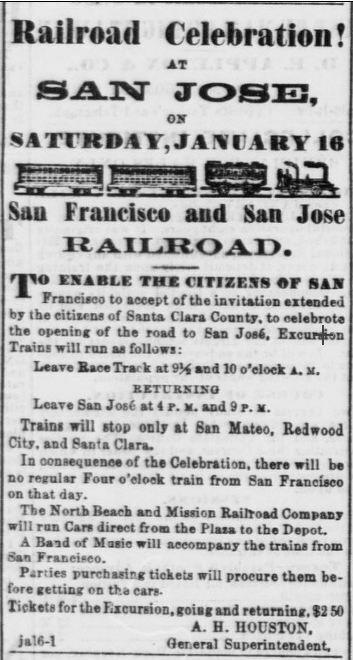 An ad in the Jan. 16, 1864 Daily Alta California promotes the “Railroad Celebration” and special trains. Caltrain’s 150th anniversary celebration on Saturday will offer attendees a unique opportunity: learn about Caltrain’s role in the region’s past while glimpsing the next generation of Caltrain service. The main celebration honoring 150 years of passenger rail service on the Peninsula will take place at the Santa Clara Station, where information booths and exhibits will focus heavily on important upcoming transportation projects in the region, such as the Caltrain Modernization Program and California’s plan for a statewide high-speed rail network. Events get underway in San Francisco with a formal plaque dedication to commemorate the rail line’s sesquicentennial. A special event train will then depart San Francisco for the event in Santa Clara. During the trip passengers will receive a narrated journey from a “conductor”, who will detail the rich history of passenger service on the corridor.. He’ll discuss the many developments that have occurred along the train system since trains began operating all the way to San Jose in 1864. During the trip, the train will stop at seven historic stations along its right-of-way, where the Native Sons of the Golden West will hold brief photo opportunities to deliver the markers, followed by a special ceremony to dedicate plaques commemorating the depots’ place in history at the Santa Clara event. Local luminaries will be on hand to receive the plaques—donated by the Native Sons—at each of the depots. Caltrain’s seven historic stations are at Millbrae, Burlingame, San Carlos, Menlo Park, Palo Alto, Santa Clara and San Jose Diridon. The history train is free to the public and will depart from San Francisco at 9:40 a.m. and arrive in Santa Clara at 11 a.m., just in time for the start of the 150th anniversary festivities. A free northbound train will also make stops at the historic stations, leaving Santa Clara at 12:30 p.m. and arriving in San Francisco at 1:38 p.m. Along with information booths touting the future of transportation, the Santa Clara event will feature speeches from an array of local policymakers, Off-the-Grid food trucks, live music, a large-scale model railroad, historic buses and wagons and many other attractions. The celebration is scheduled to last until 3 p.m.
For more information about the history of Caltrain and additional details on the celebrations, visit the Caltrain 150th website here.